This week I’m excited to share some of the more elaborate invitations we've designed for kid's parties. 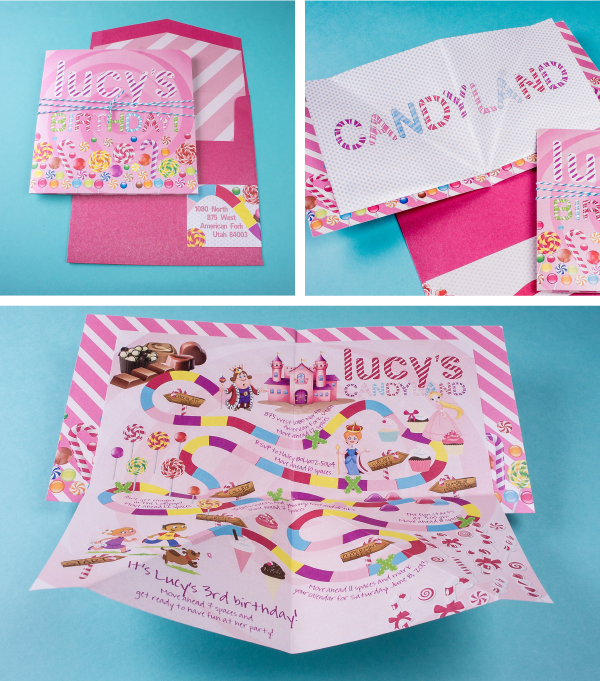 We recently were challenged to create an interactive invitation in a Candyland Theme. The design got started with the idea of recreating the Candyland board as the invitation itself. When you open the invitation the first thing you see is CANDYLAND in big bold letters and a three dimensional pop out detail map of candy land full of all the amazing things to expect at this candy extravaganza party! We figured out a unique hand fold that allowed the board game to pop out when the card was opened and then fold back up into a neat square when closed. Metallic pinks, blues, greens and candy hues graced this fun invitation. We searched high and low for a striped baker's twine in the right shade of blue and we were really glad when we found the perfect blue at the last minute. 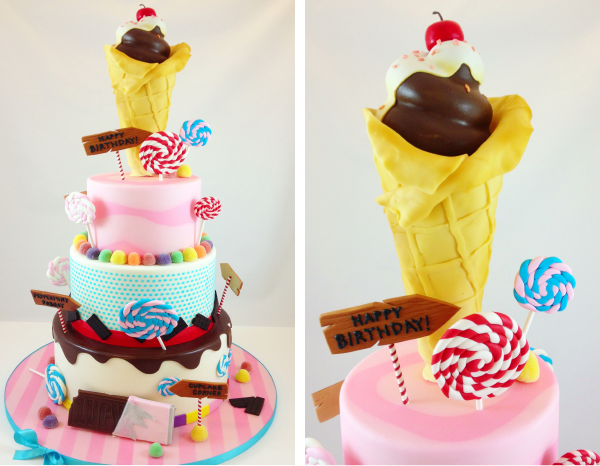 Take a peek at the incredible cake that Julie at Layers Cake created to match our Candyland invitation. I’m always so excited to see what she will come up with and once again she has taken this theme and knocked it out of the park! If you are planning a party or celebration you should really consider using Layers Cake. 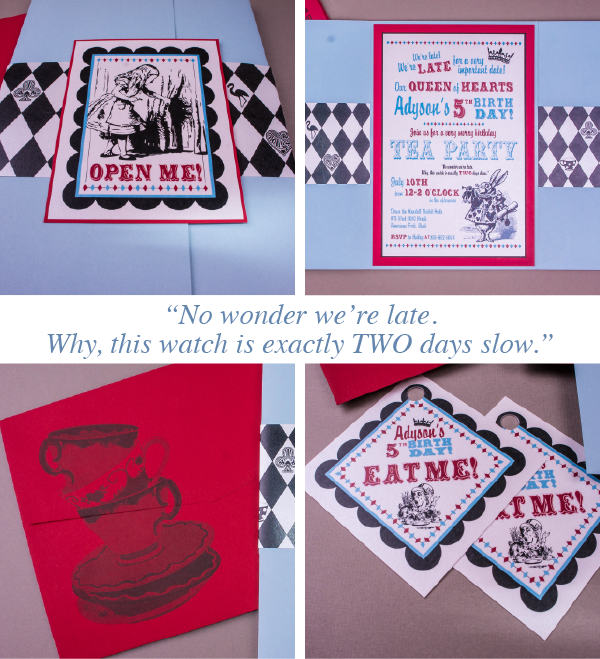 Next we have our Alice in Wonderland themed invitation. Alice in Wonderland is a really fun theme to work with because you can work mystery and intrigue into the design. We printed stacked tea cups right on the envelope so that guests were give a little hint of what was going to be inside the envelope. We thought "Open Me!" on the front of the invitation was a clever way of keeping the theme going and getting guests curious to see what is inside! When he three panel wrap is fully opened you can see how we made custom slits in the folds so that the diamond pattern bands could would be visible as part of the design of the inside of the invitation as well as the outside. The birthday party was a "tea party" and we referred to the birthday girl as the "Queen of Hearts" to keep everything in the Alice in Wonderland theme. The "Eat Me!" tags were used to give an extra touch to the favor bags of candy that were given to the party guests. 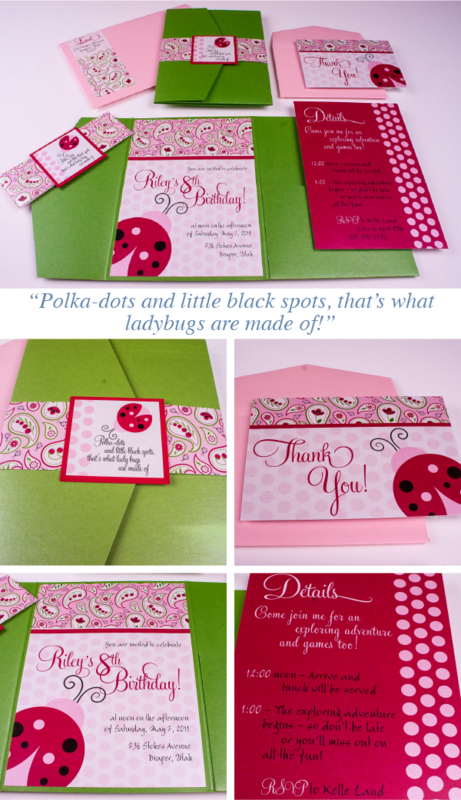 Last, but definitely not least, is our adorable Ladybug Paisley invitation. This invitation really has it all: a 3 panel wrap with a pocket, a details card, a belly band, envelope icing, and monogram card for this little girls party. The paisley band with it’s layered monogram card that says “Polka-dots and little black spots, that’s what ladybugs are made of” immediately conveys to guests that this is a sweet invitation for a young girl. When open the invite and details card give the guests all of the details of what's to come! The final touch of this invitation set is the matching thank you card. What a great way to follow up with guests with your appreciation for attending the party! It's fun when we have the opportunity to change it up from wedding invitations and create fun, themed party invitation - especially when it’s making a little kids birthday that more exciting!